somitomi wrote: and now I'd better stop confusing everyone with model railroading jargon. Clearly you haven't quite got the hang of having a hobby yet. Confusing everyone with the jargon is a substantial part of the fun. Lean into it. somitomi wrote: That's all, and now I'd better stop confusing everyone with model railroading jargon. Alrgight. Although there's going to be less jargon this time, because actually I'm more familiar with Hungarian and German terminology. So I got the locomotives cleaned and I've never seen so much dirt in the contacts of anything. Otherwise the V180 is in pretty nice condition except for the slightly worn paint while the shunter is missing a cotter pin and one of the wires going to the motor came loose. I also cleaned all the cars and straightened the couplers out. All the cars have this old coupler type unique to BTTB/Zeuke (it is kind of similar to the bügelkupplung found on H0 scale stuff) and half of them are missing the moving loop part, which means some cars can't be coupled together (because they both lack this part). I also tested the electric accessories (two turnouts and an uncoupler track), and they all work, but otherwise the tracks are in a bad shape. This bridge profile rail is notorious for oxidizing and the ties become brittle with time in my experience. A little bit of track rubber seems to have helped them, but I think I'm going to get some newer tracks if I keep the trains. In related excellent news, Roco has announced, that it will restart the production of the RocoLine tracks with roadbed, which is pretty cool, because that's exactly what I have on my layout. Consequently, the track plan of my layout was utterly terrible, because I had to work with whatever I had when production of these tracks stopped. So some parts were a bit strained and flexed to make it work and since then the whole track developed some more kinks as a result of later repairs and changes. I have now removed every piece of track to clean them, assess their state and work out the following conundrum: "How do I make major changes in my track plan without needing to bulldoze the entire layout?". Excellent! Now you're speaking fluent geek, and it's delightful. somitomi wrote: Alrgight. Although there's going to be less jargon this time, because actually I'm more familiar with Hungarian and German terminology. Got any pictures of your setup? Does it swing towards realism or towards whimsy? Are you a Terry or a Holt? SecondTalon wrote: Are you a Terry or a Holt? ObsessoMom wrote: Clearly you haven't quite got the hang of having a hobby yet. Confusing everyone with the jargon is a substantial part of the fun. Lean into it. Wanna join us on the One True Thread? We have a lot to offer in that regard. Apart from Forum Games, mostly active on the One True Thread. If you need help understanding what's going on there, the xkcd Time Wiki may be useful. Addams thanks all of us who helped. Her life is much better now. Randallspeed to all blitzers on the One True Thread! You'll never convince me that people don't get in to H0 scale because they can call it Ho Scale. somitomi wrote: Are you a Terry or a Holt? Unlike Zohar, I have no idea what you're talking about. Oh yeah, I almost forgot: Digital is cool. SecondTalon wrote: You'll never convince me that people don't get in to H0 scale because they can call it Ho Scale. Noone would make a fool of themselves by pretending not to know it's a zero and therefore pronounced as "null". Both remembered kids were dumb when the test child wanted video games. So basically it's just a repeat of the question I asked immediately before it, you Holt. The only Terry/Holt divide I could think of was Terry Pratchett and Tom Holt, which oddly enough almost works for the same question. Cool! Sure, I'll start my blitz over there once I finish counting to a million over in Forum Games. See you in about 90 years. ObsessoMom wrote: Cool! Sure, I'll start my blitz over there once I finish counting to a million over in Forum Games. See you in about 90 years. We can wait for it. It's what we do. Seriously though, you are more than welcome in the One True Thread. Also, just to make that clear, while blitzing the One True Thread is considered highly praiseworthy, it is in no way a requirement. That's not very surprising. As fas as I am aware, it has been only fairly recently that moderately affordable rail models after Hungarian (and also Polish, Czech/Slovakian/Czechoslovakian) prototypes have been on the market in any meaningful diversity. This is a field in which the former Eastern bloc countries (excluding former East Germany) are still in the process of catching up with Western Europe, and it doesn't help that on the whole the popularity of rail modelling is declining. My layout (that never got finished anyway) is currently dismantled too and is likely to stay that way for a while. I still aim to redo it and get it right the second time, but space and time permitting, after that I may start on another layout and finally make the leap to digital. I think it doesn't work that way in English - even the digit zero is commonly pronounced as "O" like the letter. That tends to prevent much of the "it's H0 not HO" smartassery that often occurs from rail modellers of other languages. Blitzing will take you only slightly less time than 90 years. I fear you might not have ~170 years to spare. svenman wrote: and it doesn't help that on the whole the popularity of rail modelling is declining. Who needs a physical model railway when you can make infinite virtual model railways? svenman wrote: That's not very surprising. As fas as I am aware, it has been only fairly recently that moderately affordable rail models after Hungarian (and also Polish, Czech/Slovakian/Czechoslovakian) prototypes have been on the market in any meaningful diversity. This is a field in which the former Eastern bloc countries (excluding former East Germany) are still in the process of catching up with Western Europe, and it doesn't help that on the whole the popularity of rail modelling is declining. I think you just summed up several thousands of comments from Hungarian model railway forums. The Hungarian market is tiny, and the most iconic prototype vehicles are unique to the country, which doesn't exactly encourage "large manufacturers" to invest in developing models specifically for us. Apparently Poland and the Czech Republic are more appealing markets, it seems to me like there are some models specific to that region, although there have been promising signs recently, such as the V63 model produced by ACME. svenman wrote: My layout (that never got finished anyway) is currently dismantled too and is likely to stay that way for a while. I still aim to redo it and get it right the second time, but space and time permitting, after that I may start on another layout and finally make the leap to digital. Good luck on that endeavour. svenman wrote: I think it doesn't work that way in English - even the digit zero is commonly pronounced as "O" like the letter. That tends to prevent much of the "it's H0 not HO" smartassery that often occurs from rail modellers of other languages. I knew that, but I still couldn't stop myself. Surely there are exceptions, though, even if you restrict yourself to pre-1990 rolling stock. The M61, being the Hungarian variant of the NoHAB-GM family, certainly must count as iconic, and the much less glamourous but also way more widespread M62 is also a type not specific to Hungary. 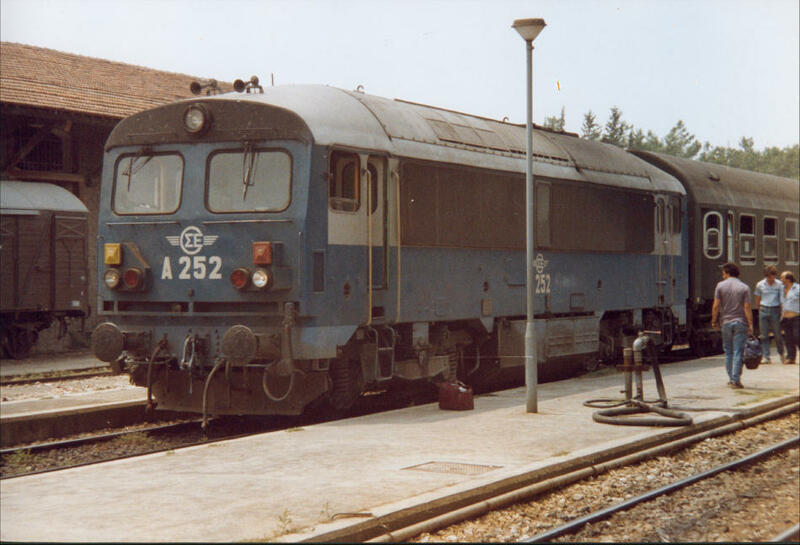 The M41 or a very similar-looking diesel locomotive was also exported to Greece, but that doesn't really help as Greece isn't one of the affluent Western European countries with well-developed model railway markets either. It seems there is quite a number of former Czechoslovakian diesel locomotives that have been exported second-hand to Italy. This of course must also increase the chances of those prototypes being modelled by Western model railway producers. somitomi wrote: Good luck on that endeavour. svenman wrote: Surely there are exceptions, though, even if you restrict yourself to pre-1990 rolling stock. The M61, being the Hungarian variant of the NoHAB-GM family, certainly must count as iconic, and the much less glamourous but also way more widespread M62 is also a type not specific to Hungary. Okay, the NoHAB is the definition of iconic locomtive around here, that is true. Sure enough, both M61 and M62 can be found in the sortiment of various manufacturers, as can be the types of new rolling stock acquired since 1990, such as the Siemens Taurus, Bombardier Traxx or the Stadler Flirt EMUs (those things really took over the Hungarian rails). On the other hand are locomotives like the V43 (produced by a relatively small firm called Fuggerth until recently1), the M44, M40 or the legendary 424. And that gets me to steam locomotives, because you're absolutely not going to find anything like the vast selection of German steam locomotives. Your options are the Roco 109 109, making it yourself or bearing the expenses of a small-batch product. svenman wrote: The M41 or a very similar-looking diesel locomotive was also exported to Greece, but that doesn't really help as Greece isn't one of the affluent Western European countries with well-developed model railway markets either. Funny you should mention that, because Fuggerth also produced an M41 model, and they did make a Greek version of it. I'm not sure how much of those made it to Greece, but they turned up occasionally on the Hungarian used market at low prices (because most people would look for the Hungarian version). 1The current status of the company is kind of a mistery, beause their production volume has plunged a couple years back. Rumors about the demise of the company have been fiercely dismissed on forums as a cheap ploy by quote-unqoute "merchants" hoping to sell used ones at a profit. Nonetheless, you can rarely find their products in stock at any shop and so the price of used ones has at least doubled since then. And suddenly, I bought a reel-to-reel. Well, not that suddenly, I've been looking for one this last month, but I was about to give it a rest for a while when this one popped up in a forum. It's not in the best shape cosmetically, but then it was rather reasonably priced and so far it seems to work properly. A little bit of cleaning and such will be necessary though, but that is the fun part. A friend of mine has a crummy old reel-to-reel that he wants to replace. He uses it (among other things) for a slapback echo on the vocalist when he mixes down a jam session. He's also used it as treatment for distorted guitar, which I like very much. Tape has an elegant way of taming wild EQ. somitomi wrote: And suddenly, I bought a reel-to-reel. Hey, that's my machine! (Edit: close, but not quite. Mine goes to eleven more.) Bought it (koff) years ago in college and used it to record many choral concerts I was in, and even to record the (sync) sound for a movie I made (koff) years ago. Really excellent device; Sony at its best. One of the things that impressed me was that even at 3 3/4 ips, the hiss was less than the studio hiss on commercially produced records. Alas, the belt snapped a while ago and I haven't found a replacement yet (and with house construction haven't managed to glue the old one back; I'm in the process of using it to back up my collection of masters to CD and .wav. Nowadays I use an R-09 for live stuff, and I'm looking to get a digital multitrack. It's amazing how the prices have come down. And the sizes... in the space of one seven inch reel to reel tape I can house... well, everything I've ever recorded. And back it up losslessly. But I miss my TC-377. Anybody know what kind of (main drive) belt it takes? Gotta be a standard belt whose identity is a closely guarded secret. ucim wrote: Anybody know what kind of (main drive) belt it takes? Gotta be a standard belt whose identity is a closely guarded secret. Scanned service manuals are available online (for example here), you might be able to find the necessary information in it. Or if that fails, I could measure the belt in mine, and hope that it's the same size. Another advice I often see is to take the old belt to a place selling seals, gaskets and such, and get a similarly sized O-ring. I haven't tried that one though. Woo! a little widget that I thought I was going to have to make myself is a 99p item on ebay from China (a 1/4" to 3/8" thread male-to-male adaptor to replace the crappy plastic one that came with the fitting that turns my hiking pole into a monopod for a camera). The variety of stuff you can just get off the shelf boggles the mind sometimes. Yesterday I had a glorious savage of a bus driver. This girl boards the bus while talking on her phone, obviously barely aware of her surroundings. Bus driver: "Oh, I thought you greeted me. <beat> But you didn't." I couldn't see the driver's face, but I imagine it looked a lot like this. That girl was so annoyed! ConMan wrote: The only Terry/Holt divide I could think of was Terry Pratchett and Tom Holt, which oddly enough almost works for the same question. Oh, good, I'm not the only one. Although I thought that using the forename of one and the surname of another was odd. Dthen wrote: I AM NOT A CAT. Terry prefers the informal among his peers while Holt prefers the formal. Terry also occasionally delves in to the third person, making it impossible to tell if Terry is being quoted or described. Is that a quote or a description??? Ha, you did the thing. SecondTalon wrote: Terry prefers the informal among his peers while Holt prefers the formal. Terry also occasionally delves in to the third person, making it impossible to tell if Terry is being quoted or described. Good thing chridd never refers to themself in the third person, so you can always tell that they're not being quoted. chridd wrote: Good thing chridd never refers to themself in the third person, so you can always tell that they're not being quoted. So, is this a paradox then? It turned out the issue with my reel-to-reel wasn't anything serious, I just needed to clean the heads. So now I'm in full retro-hifi mode, recording from vinyl onto 1/4" tape solely because I can. I visited a model railway exhibition with some of the finest layouts I've ever seen. Wish I had photos, but I didn't take a camera with me because given my skills (and shaky hands) the photographs would not do justice to the layouts anyway. This company called Viessmann has the habit of selling super-cheap stuff at model railway events like this, this time including bags filled with various combinations of faulty and incomplete stuff (I'm guesssing they just bagged things rejected by quality control). Not only did I get a fully functional semaphore signal for less than tenth of the usual price, but the bag also included an incomplete distant signal (it doesn't seem to be beyond repair though) and other useful bits. Nice. Getting useful stuff for cheap is always pleasant. I almost said, "you, too," in response to a cashier's, "enjoy!" but I stopped myself. Feeling pretty accomplished.